Woomera Launches A British UAV, Built By The Real "Q"
A trickle of news reports worldwide indicates that an odd British unmanned spyplane, the Zephyr 3, is flying in remote Woomera, South Australia. The project is shrouded by a cloak of secrecy, even though many significant features of the aircraft have been revealed. It is likely that the machine is destined for covert or clandestine undertakings, once testing is complete. The Zephyr 3 has a 40-foot wingspan but weighs only 26.5 pounds, thanks to ultralightweight composite materials and painstaking design. 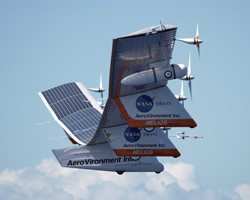 It is a spanloader, an aircraft designed to bear its loads evenly across a long wing, although unlike previous solar-powered spanloaders, it does have a large, delicate V-tail at the end of a stalky boom, for stability in the thin atmosphere. It is powered by solar cells and is meant to be a stepping stone on the way to an air vehicle that would sustain flight permanently by using hydrogen fuel cells to store energy during periods without sunlight. In its 2003 iteration that was shown to the press, the black plane had five electric motors, and reportedly the new version still does. Each motor has an output of 1 kilowatt; that power is expressed through unusually-shaped black propellers that are optimized for the thin air of the high stratosphere. The inner wing panels are set level and the outer ones have fixed dihedral; they're constructed predominantly of carbon fiber. 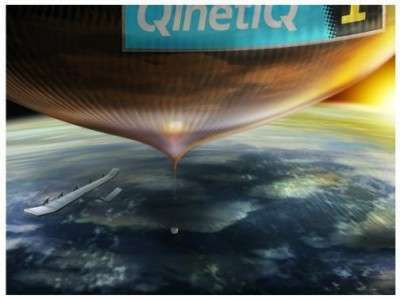 The reason that we know some of these details despite the 2005 news blackout is that in 2003, Zephyr 3 was being a bit more publicized than it is now, as part of the QinetiQ1 high-altitude manned balloon attempt, which was spoiled by a torn balloon envelope (it may go this summer, but probably without Zephyr 3). For example, the plane's chief designer, Chris Kelleher, spoke with the BBC, which was also allowed to photograph the plane -- then. But now, the guardians of Zephyr have since become much more close-mouthed -- which may indicate that its manufacturer has secured a somewhat publicity-shy customer for the innovative, spindly contraption. Now, the UK MOD admits that Zephyr exists, and that it will fly in the Woomera, South Australia, prohibited area, but will not comment on any details. The unmanned craft will reportedly climb to 132,000 feet, which would be a world record -- but the British scientists behind it say that they may let the record go unclaimed, in order to preserve the secrecy of -- well, whatever it is they are up to in the Outback. 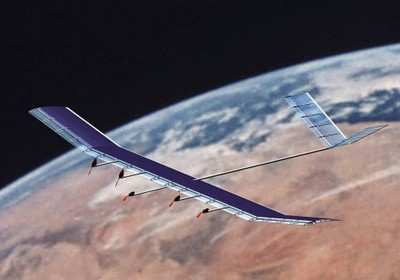 The highest altitude a similar solar UAV has achieved is 96,000 feet, a record for non-rocket craft set in 2001 by the experimental NASA/DARPA Helios project, a similar solar spanloader that could be configured with 14 powerplants for high-altitude performance (as in 2001), or ten for long endurance (as in 2003). The conditions at the altitudes reached by Helios, and to which Zephyr expects to go, are very harsh. The ambient temperature is extremely low. But there is so little atmosphere to shield the machine from the sun's rays that the solar panels risk overheating, and the carbon fiber structure must be protected from thermal and ultraviolet damage. To get to that height the Zephyr 3 will almost certainly be launched from an intermediate altitude by some other air vehicle, probably a helium balloon. One reason is that the lightly-constructed machine, optimized for flying in the ultra-thin air at six-figure altitudes, is extremely vulnerable to gust overloads in the thicker air down low. 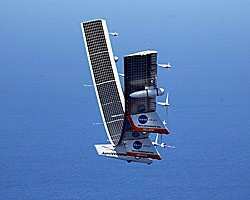 That same weakness caused the loss of the Helios 03 high-endurance prototype off Hawaii in June 2003, on only its second test flight; in normal flight, the wing takes on a bit of smiley-face bow, but the Helios wing bent back on itself with a dihedral of over thirty feet (!) before breaking up (photo sequence). 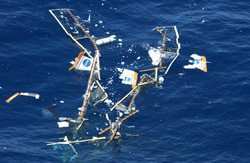 NASA's accident report blamed it on the impossibility of predicting the instability that turbulence caused. Certainly the Britons will have absorbed this NASA report and taken it to heart before they commit Zephyr 3 to the heavens. There is no word on what the MOD's purpose for the aircraft is, but that doesn't stop people from speculating. The most typical uses for such high-flying craft are reconnaissance and surveillance, or radio relay. The British special operations forces have been known to use high-flying C-130s as radio relays, in the same the way their US counterparts use satellite communications. By employing fuel cells to hold power during hours of darkness -- fuel cells were under test in the ill-fated Helios, too -- the Zephyr could orbit endlessly, beyond the reach of most enemy weapons, like a satellite. Such an "eternal UAV" has advantages over a satellite for surveillance or communications-relay missions, too: it's far more easily redeployed when requirements change, and far more easily serviced than a satellite -- ask the glum scientists of the Hubble deathwatch. Woomera has a long history of secret projects. The British launched their first home-grown satellite from there, and British nuclear scientists worked there (in the days of atmospheric nuclear testing, the UK tested in Australia). Later, the US had a secret installation at Woomera which closed a few years ago; its purpose has never been fully disclosed for security reasons. There is, inevitably in anything secret and British, a Bond connection: the builder of the UAV is QinetiQ, which was the Defence Evaluation and Research Agency before being privatized, and which deliberately chose the "Q"s that start and end its name to honor "Q," the arms- and gadget-maker to Ian Fleming's fictional master spy. 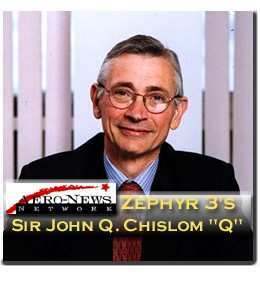 The actual CEO of Qinetiq, Sir John Chisholm (photo), has made cooperation with the US and other western R&D operations a cornerstone of corporate planning; Qinetiq is developing an panoply of technologies for everything from zero-zero VTOL landings of the US/UK Joint Strike Fighter, to anti-jamming measures for satellite networks, to countermeasures against submarine torpedoes. And somewhere in South Australia, they're doing... something... with a solar powered airplane that flies very high and almost never comes down. (Note to editors worldwide: please stop calling unmanned aircraft "unmanned drones". That term is a registered trademark, licensed only to the US Government Department of Redundancy Department. Do you know of any manned drones? ).